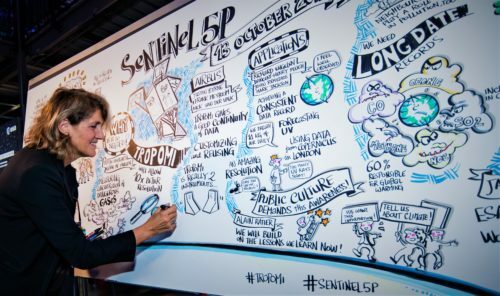 800 VIP audience on site plus 17,000 viewers of the live broadcast have watched the launch event of the Sentinel 5P satellite, which has been produced out of ESA’s technology centre in Noordwijk, Holland. With 81 international media on site, the coverage has hit the 200 million mark, triggered by 17,016 tweets and more than 5,000 interactive users, plus TV, radio and news desks. The show was moderated by Louise Houghton, the live scribe provided by Lucia Fabiani (picture), while I have prepared and produced the live stage event and directed it on site. 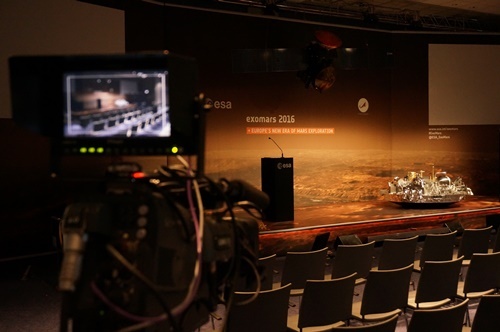 When Thousands of citizens entered behind the hidden gates of ESA’s Space Operations Centre in Darmstadt early September, they have listen to and watched a series of short presentations about Space Tec and Space science across the centre’s past 50 years of existence. I have managed and iterate with 35 different presenters, amongst them directors, astronauts and top level scientists, the fast paced programme with short stories of just a few minutes, aiming at the visitors‘ emotions, and demonstrating the varienty of Space activities and their benefits to the people. 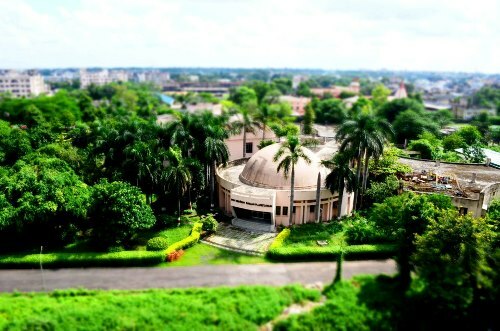 With two large planetaria in India, my Fulldome show has found its way into 85 different planetaria in 27 countries worldwide: It’s the Regional Science Centre in Calicut, Kerala, as well as the Raman Science Centre in Nagpur, Maharashtra (picture). They will show ‚Journey to a Billion Suns‘ in Hindi, Malayalam and English. From the beginning, Indian music was part of the film’s soundtrack, playing a traditional Indian Surbahar (similar to a Sitar), in combination with a European church organ – both of them holy instruments making the grandness of outer Space tangibly devine. भारत आपका स्वागत है! | സ്വാഗതം ഇന്ത്യ! ESA’s data archiving centre in Frascati (Italy) handles Petabites of data, coming down from Earth observation satellites every day. But how do engineers store them for decades and make them available to tens of Thousands of scientists in our technologically ever changing world? This stop-motion video explains it. 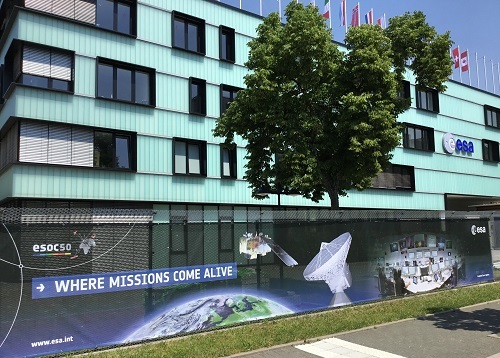 It’s shown to visitors at ESRIN’s new data centre exhibition on site. See it here in its full 3min length in English or in Italian. Visitors at the European Space Operations Centre are warmed up by a video that I have produced in 2013 – now it was about time to replace it. And because the audience loves ist style, it has been updated with latest mission profiles instead of making it from scratch – with three brand new language versions and a new script. See the full 11 minutes video under FILM here. 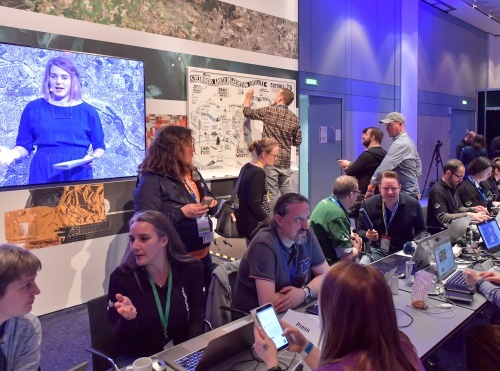 More than a Hundred bloggers and professionals in social media, such as Twitter, Facebook, Instagram and Snapchat, followed the Sentinel2Go Social Space on site in Darmstadt (Germany), when the new S2B satellite has been launched into orbit. The brand new event concept has proven its power: 14,000 watched the live stream for a 130,000 minutes in total. And more than 4,000 active Twitterers have triggered an outreach of 21 Mio. messages, with number one in trending for a half day. The audience was enthusiastic about the fast and dense style of the event, which fell under my responsibility. 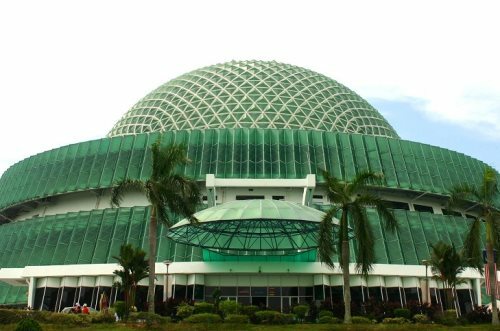 The spectacular National Planetarium Negara in Kuala Lumpur will be number 80 world-wide to show my fulldome film „Journey to a Billion Suns“ as from 2017. The 45min documentary about the distances in the Universe runs on four continents and has been celebrated as one of the highest quality planetarium films on the market. It exists in 15 different languages, including Japanese, Korean, Hindhi, Russian and Chinese. 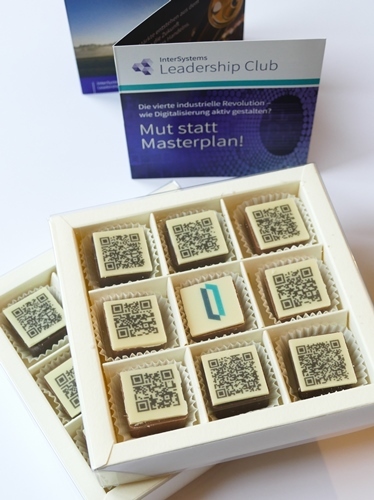 Another idea in a vVIP target group to give digitalization a shape: I have developed, together with my customer and a small chocolate manufacturer, the QR code chocolate. Getting there was a real challenge. First, QR codes need a certain resolution to be recognized by the popular readers on the smartphone – and not all of them perform well. Some don’t understand any umlaut, most of them can’t read codes in negative appearance. After a long sample series of blurred and distorted test images, I have identified the best printing method and size, and gave it to the makers. The manufacturing made the chocs from finest Belgian ingredients by hand, printed the codes and hand-sorted them into the box. An additional printed leaflet helped connecting the event and the relevance of digitalization. The audience fully appreciated the idea, as well as the chocolate – because after all it was delicious. 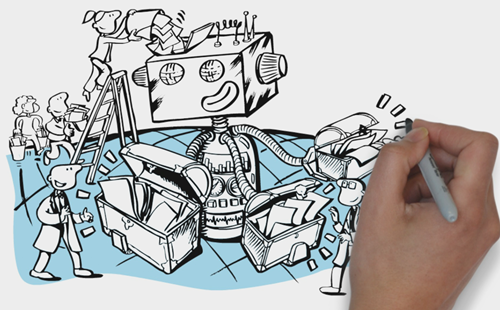 What is the shape of digitalisation? 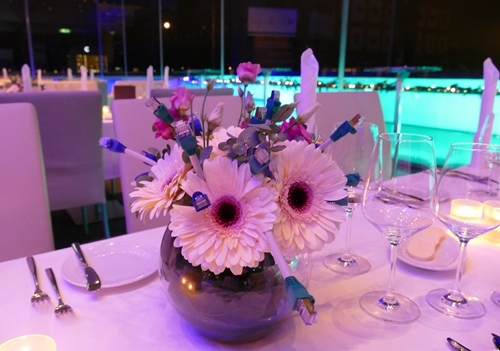 How can industry 4.0 be incarnated at a VIP dinner? One of the iconic tools of our digital, interconnected world are all those colorful network wires. Everybody needs them to plug into the internet. Millions of them connect server farms and network nodes like a giant spider net would look like. I have used standard CAT 5e cables, hand-crimped RJ-45 connectors onto their tips and added kink protection sleeves in the logo colors of the customer. Each twenty of these digital flowers were added to the bouquet of gerbera and roses – reminding the invited guests of what is it all about. Thanks to the florist, who made it all become true. The landing has finally not worked, but the social media feedback was enormous. While the European EDM lander attempted landing on Mars, I have produced a live social-TV coverage on Facebook, broadcasting the final 15 minutes of descent in a new, totally interactive TV environment. An amazing experience, with more than 100K audience permanently watching it.